What if I tell you to un-punch someone, what you do then? (SPOILERS) Incredibles 2 may not be as fresh as the first outing – indeed, certain elements of its plotting border on the retread – but it's equally, if not more, inventive as a piece of animation, and proof that, whatever his shortcomings may be philosophically, Brad Bird is a consummately talented director. This is a movie that is consistently very funny, and which is as thrilling as your average MCU affair, but like Finding Dory, you may understandably end up wondering if it shouldn't have revolved around something a little more substantial to justify that fifteen-year gap in reaching the screen. It would be fair to say that my favourite Pixar pictures to date have been Brad Bird joints (The Incredibles, Ratatouille, although Andrew Stanton's WALL-E takes third) and that I haven't been the greatest advocate of their sequel locomotive of recent years. The Toy Story follow-ups were largely worthwhile (and lauded to the heavens), but I probably break with the trend in considering there to have been no real need for them (and I wasn't that bowled over by the first in the first place). The recent raiding of their crown jewels (Finding Dory, the announced Toy Story 4 because naturally) has rather supported that, and truth be told, you aren't going to find any bucking of the trend with Incredibles 2. Nevertheless, and stirring and repeating as it is the huggable family dynamic theme common to the studio's entire output, the zest and energy on display here ensure it would be churlish to begrudge this addition to the ranks. The heel-dragging on a sequel was purportedly because Bird couldn't come up with an idea (and it kicking into gear was absolutely nothing to do with Tomorrowland flopping), which might suggest to a cynical view that he eventually just went with what he had (rather like Indy 5 taking years longer than it needed, only to come out not very far from how Lucas wanted it in the first place). We start where we left off, with the Underminer (John Ratzenberger) undermining (and likely to return in the third instalment? ); even if the first movie didn't actually come out and say it, it was easy to infer that, through their triumph over Syndrome, superheroes had been accepted once again (despite Dash's deferred winning dash). Not so, as Bird is intent on returning us to the original's status quo pre-learning/character arc, a problem encountered with many a sequel, not least the roundly-lambasted Star Trek Into Darkness (although, here it's narratively rather than emotively). Not only is the family's right to be Supers rudely shutdown no sooner than they have worked as a unit, but one of their number is also soon prevailed upon by a super-rich individual to don the mask once more and fight evil - only to be revealed as a purveyor of evil themselves. There's a near repeat too in the villain's end goal – while Syndrome wants to make everyone superheroes such that the term becomes meaningless, Evelyn – I didn't realise Catherine Keener was voicing her, although even without knowing, it very quickly becomes clear the character's a wrong 'un – plans to kill off any chances of superhero acceptance permanently because she thinks everyone would be better off if there were no superheroes, if everyone was the same and so not looking to be saved by anyone. It's a solid motive – the dangers of salvationist doctrines in whatever form – but it isn't a very interesting one. On top of which, even given her brother Winston's (Bob Odenkirk) plan to render supers legal once more, it seems like a convoluted way for her to go about things (given she has the hypno-goggles, she didn't need to wait for her brother to act to put her scheme into operation, which is only going to re-affirm the current law anyway). Bird appears to have built into his villain’s rationale an acknowledgement of the Randian objectivist doctrine he is sometimes accused of endorsing through his films; Supers going about doing their thing unhindered is essentially selfish and causes society as a whole to suffer. It would be better for all – never the goal of the objectivist, since rational self-interest is their ethical god – if there were no Supers. There are flaws in reading an objectivist stance into The Incredibles – if you're seeing the Parrs, and particularly Bob's, behaviour as essentially selfish, then you have to regard any instances of their helping others as essentially selfish, rather than altruistic, and I don't think this behaviour (in either picture) is coded that way – just as there are apparent confirmations – government is very much positioned as removing extraordinary people's (the only ones who count) rights. Added to which, the villain in both movies resents Supers specifically (in her case it is blaming them for the death of her father), rather than your standard bad guy wanting power or riches, so assumes the same role as government, of holding back the truly talented and special from unfettered achievement. 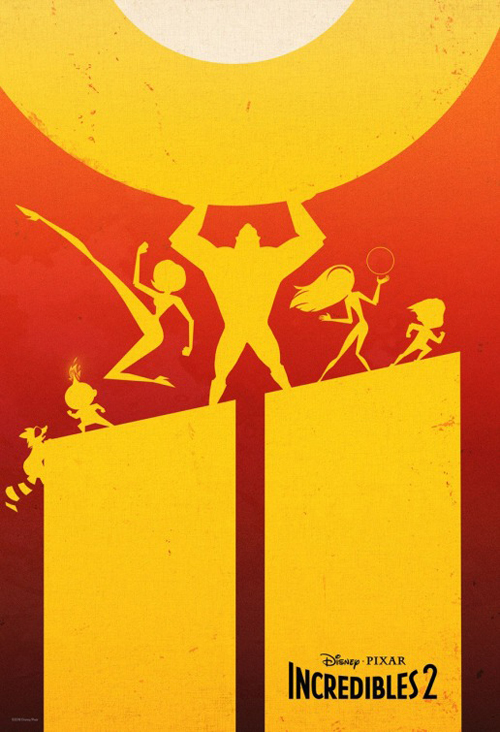 Ultimately, Incredibles 2 reaffirms the need for Supers (they regain full status) so one might argue objectivism wins out (the same as Ratatouille and its genius cooking rat, and Tomorrowland and its utopia for overachievers rekindled). But I've never been overly convinced by the objectivist charge levelled at Bird, and as Vox points out, it's possible to be engaged by facets of an ethos yet not wholly persuaded by it; "All of his movies grapple with objectivist themes, to be sure, but they also don't conclude that doing what’s best for the self is what’s best for everybody". It doesn't stick any more than the argument of the Screenslaver, the "cover" motivation that people should quit being – per his name – slaves to their TVs (while it's only really identified as such in a newspaper in the original, these movies are set in 1962, doubtless seen by Bird with his rose-tinted spectacles, a tender five at the time, as the USA on the cusp of things turning "bad" and so perfect for visions of halcyon days and nostalgia for an alt-present/potent future that never happened: see also Tomorrowland). Sure, the Screenslaver's screed could be claimed as a serious point about our current addiction to devices, although the delivery is pretty much incidental, but you have to balance that by recognising the movie's utterly awestruck response to technology, in thrall to supercars, supersuits, superbikes or superbaby-handling gizmos. Bird touches on a range of different themes and ideas in Incredibles 2, but generally with a commendable lightness of touch. The gender role reversal is the really obvious one – Craig T Nelson's Bob doing Mr Mom, Helen becoming the breadwinner – and under normal circumstances this would probably come across as exactly as redundant and tiresome as that sounds, but both sides are played out for maximum effect and realised scenarios and as such avoid feeling stale. It's that magic Pixar dust. There's more fun to be had with the Bob side, admittedly, simply because it's funnier – his parental mistakes and mishaps, the developing powers of Jack-Jack, the visit to Edna – and because Nelson's delivery, resigned, weary emasculation personified, is blissful. Helen (Holly Hunter) doesn't really get lighter moments, designated to chase the plot, respond to exposition and engage in the main action; a debate with Evelyn over roles, ostensibly relating to who creates and who sells the creation, is really about the gender hills they have to climb, and it's one of the few times Bird seems to struggle with overstatement, hence its culminating in their mutual laughter like something out of a regrettable Hanna Barbera cartoon. The element of big corporations and media manipulation is presented as an aside, but even when it's an ostensibly positive force, DevTech is marked out as a lobby group of dubious ethics in the shameless lengths it goes to to get the law changed; no wonder Helen never feels quite right about their propaganda machine. It's later revealed that DevTech is initiating false flag attacks as a means to further the agenda of one of its founders. As such, the potential of the hypnosis ray as a means of instilling mass-obedience might have been put to more interesting effect than it is. Continuing the corporate theme, Violet observes that Evelyn will probably only serve a fraction of her sentence, being rich, which no one attempts to deny. It's an implicit slap in the face of the presumed objectivist position, and a small dose of present-day cynicism intruding on Bird's idealised world. Bird continues to display a dizzying mastery of the action sequence, even if some of the actual plot material – such as out-of-control vehicles, at the start, middle and end – isn't that incredible. More impressive is anything involving Jack-Jack's powers, where the gasps and guffaws are often interchangeable, or the fight between Voyd and Violet, one creating voids and the other anticipating her reappearance. There's a confrontation between Helen and "Screenslaver" that unfolds in surprisingly creepy fashion as she first searches his lair. And anything involving the league of hypnotised Supers is both amusing and fulfilling the potential of a Pixar movie about superheroes, if occasionally reminiscent of Mystery Men; Reflux, throwing up hot lava, can'’t help but recall Paul Reuben's stinky Spleen. Then there's Screech, who seems vaguely based on Nite Owl in Watchmen, while He-Lectrix suggests Matthew Goode's Adrian Veidt (there's also been discussion both of how Voyd fits as a LGBT character and one also possibly inspired by Kristin Stewart). By far the best confrontation in the movie, however, is Jack-Jack versus a vicious raccoon, which comes across as if Blue Sky abruptly took over the reins for a single sequence. Inevitably, I ended up feeling sorry for the racoon (it's heartening at least to see how much the poster designers took to the wee trash panda). Bao, the short film that accompanied Incredibles 2, did nothing for me at all, so much so, I was sent searching for a synopsis after the fact. Now, having been duly dunked in sickly swathes of sentiment, I wish it was more like Little Otik, as I first assumed (predictably, the media have turned a failure to engage with the material as a finger-pointing exercise in cultural insensitivity). Incredibles 2, then, continues the trend of Pixars this decade, that of less tidily constructed, somewhat derivative reinventions of the movies they were producing the decade before. Which is not to say it's a disappointment – far from it – but that they're still going to have to pull something out of a post-Lasseter-era hat to rediscover their full creative potential. Perhaps subscribing to a take-no-prisoners, objectivist policy in a quest of unparalleled product? Perhaps not.